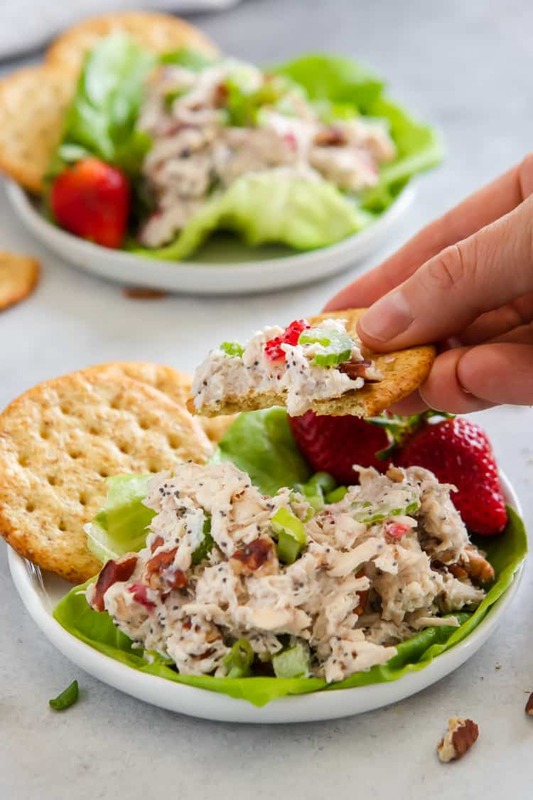 This Crunchy Strawberry Poppyseed Chicken Salad is a great way to celebrate berry season and beyond! 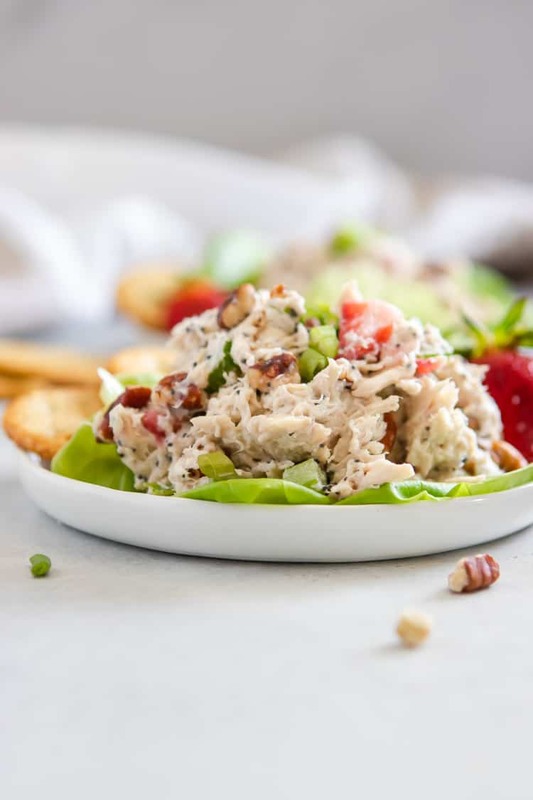 Crisp celery, pecans and poppy seeds give this simple chicken salad a fun twist on the traditional recipe. Actually, I may have already confessed it here, but just in case I didn’t, I will let you know today. There was a time that I used to act like I didn’t like mayo because it was on my “bad food” list– ya know, the made up list of no-no’s and off limits food becasue in my mind they were deemed evil. I mean, to say that I didn’t like a food just so I wouldn’t have to eat it?? Come on, Lorie! But it’s true, and I did it on more than several occasions. It was one of the “tricks up my sleeve” to make it easier to turn down foods I thought were not “clean” or “healthy.” So sad, but sadly that was reality. That was the warped thinking that I had over the years of restriction and my own form of dieting. So you can imagine then where this is going. Yep. I like mayo. I like it. It’s not my favorite food and I am not going to drink it straight from the bottle, but if I want something with mayo, gosh darn it, I am gonna eat it! And enjoy it a bunch. End of story. I can tell you it was tricky in my first few months of throwing away all the food rules. It was hard not to feel devilish as I bit into foods that had once been forbidden, but over time, the taboo of eating things like this wore off and then it just became life. Being able to go to events and restaurants without worrying about what would be served was so freeing! So many other new freedoms came along with letting go. I can say that in this world right now, it can be easier to live sometimes with that diet mentality of good and bad foods because it is EVERYWHERE we go. 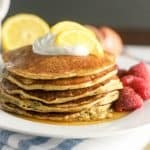 It is more of the standard or the norm to eat in a way the will help us lose weight, or get lean, or any other buzz phrases, but I can vouch that it is better living to deny this way of life. I just wish it wouldn’t have taken me so long! So I am sure you are wondering where this is all going, right? We are headed straight to a recipe that includes mayo of course! Yep, that stuff that I do not hate and never have. And the stuff that makes this recipe taste aaaamazing! 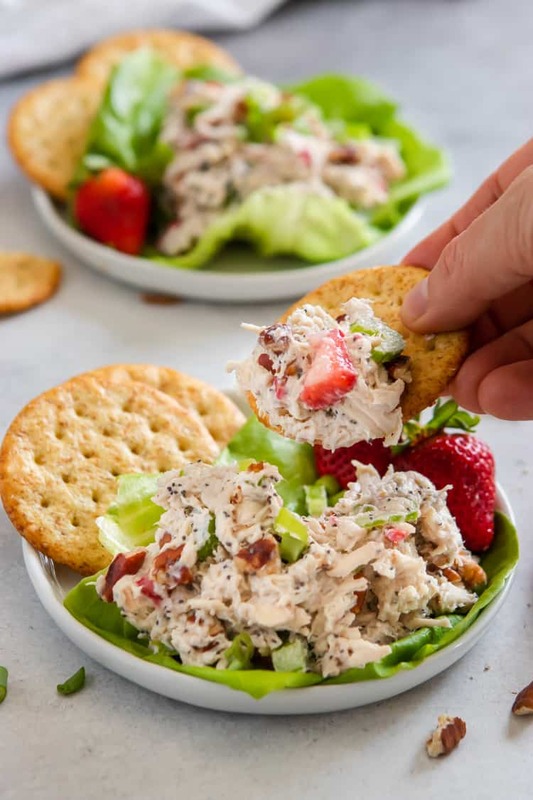 This Crunchy Strawberry Poppyseed Chicken Salad is a celebration of the fact that I can enjoy all foods that I love–and no guilt is gonna be connected to it. Summer time means a lot of things but in the kitchen it means a whole lot of berries to me! Strawberries are one of Sam’s favorites so we have these in the house at all times these days. Recently I grabbed a rotisserie chicken from the grocery and leftover rotisserie chicken makes a mean chicken salad. 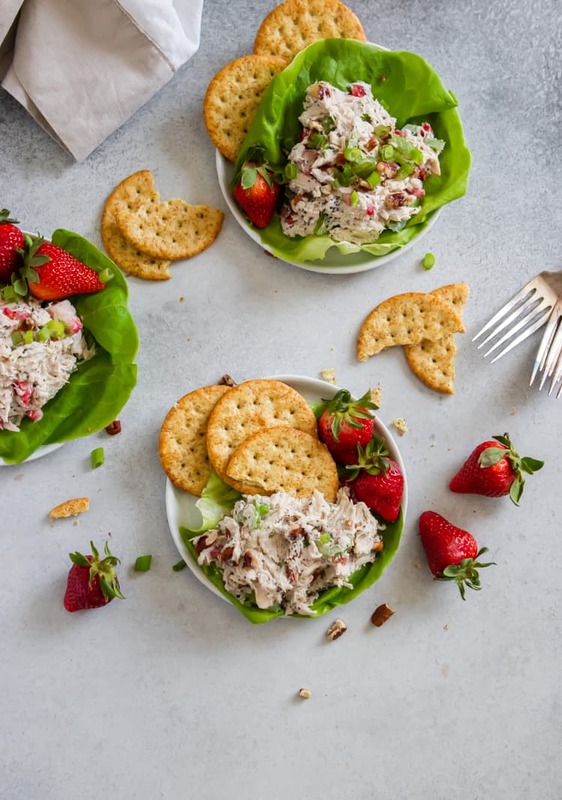 A few strawberries were on their way to going bad so one thing led to another and this crunchy summer chicken salad was born. This salad is a sign that I really am turning into my mom. 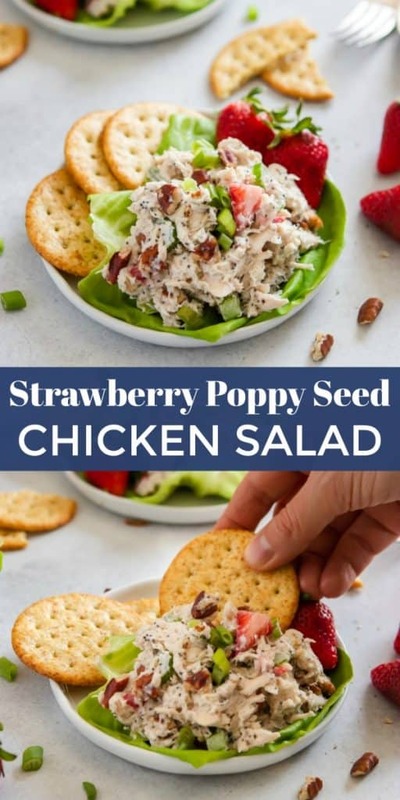 She used to add celery, apples and other crunchy goodies to her chicken salad growing up and I wasn’t that much of a fan then. However, that is all in the past and everything I can toss into my chicken salad is fair game. The celery is always a must for me. I don’t always add nuts to mine, but pecans along with the strawberries was the perfect combo. The poppy seeds add a bit of beauty to any recipe in my honest opinion but they also add a tiny crunch and add to the overall flavor. 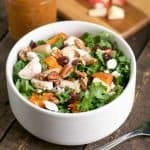 A hint of Dijon mustard, mayo and Greek yogurt give the salad a nice tang. It’s seriously going to be one of my 2018 summer salads for sure. And it can be all yours too! Cut and chop ingredients accordingly. 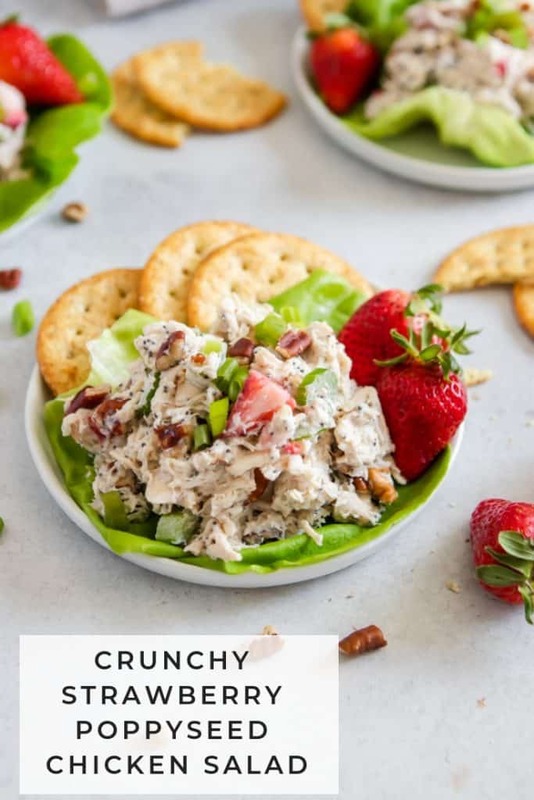 In a medium bowl, combine chicken, pecans, celery and onion. Stir to evenly mix. Add mayo, yogurt, mustard, poppy seeds, lemon juice and salt and pepper and mix well to evenly coat. For best results, allow to chill for about 30 minutes before serving. Yummm – This looks like a real deli style sandwich. I love mayo so I won’t have any mayo issues. 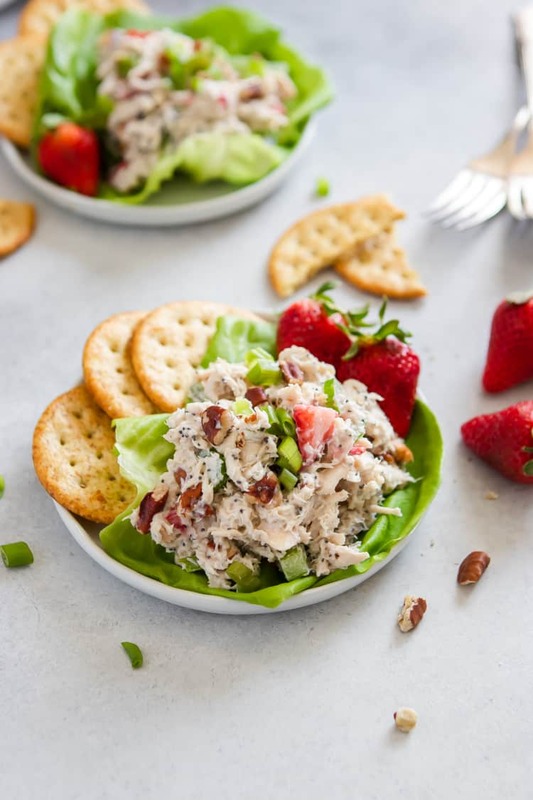 I have my family coming to stay this weekend and I think this will be a great filling for the couple of lunches i will have to prepare! I will go and get a beautiful loaf of sourdough and it will be a super lush meal. This will be perfect on sourdough!!! I don’t buy into the whole this isn’t good for you type of thing anymore. There are so many different foods that have been bad for a person over the years just silly. We like our mayo and will enjoy it all summer and year long. 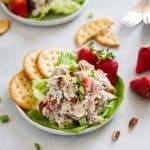 What’s better than fruit in chicken salad!? I love the touch of dijon here and those poppy seeds! 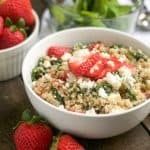 Can’t wait to add this to my summer lunch menu! Looks delicious! 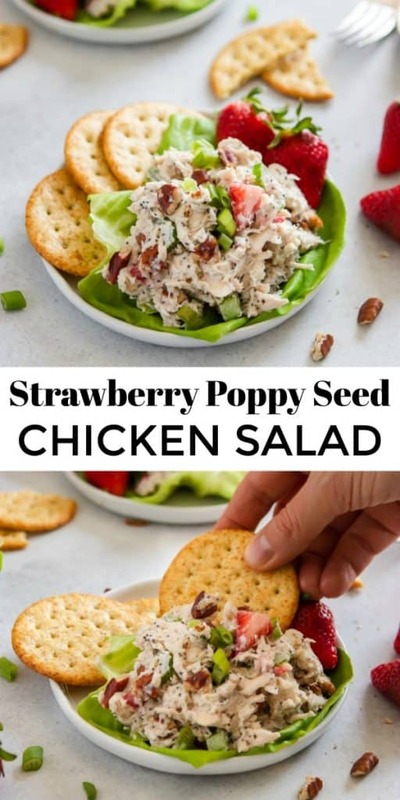 I never thought to take this twist to chicken salad! I was quite pleasantly surprised! Thanks! That is too funny! I love mayo but I know people who don’t like it and prefer Miracle Whip. I enjoy both, depending on what I am eating it with. This recipe looks great, I need new ideas to liven up my chicken salad. This looks soooo yummy!!! Saving the recipe! Hope you love it Jillian! It’s turned into a big hit around here! For some reason I can’t pin this. I’ve tried different browsers, using the widget on the side, the widget on the picture, and the browser app button. They all say something’s gone wrong. I tried when this initially came out and today. No change. Hi Sherwood! I am having the same issue for some reason as well. I am working with my web people to see if they can figure out the issue. I will keep you posted! Figured I hadn’t tried in a while, so I gave it another go. Finally got it! So so so happy to hear! Thanks for letting me now! I am not creative in the kitchen at all. This recipe sounds delicious, but we have a bit allergy in our family. What would you recommend as a substitute? Hi! I’m assuming that was nut allergy?? Gotta love autocorrect. If that’s the case, you could skip the pecans all together, or you could add some crunchy sunflower seeds even. Let me know if it was something else!